Visual Net Design is a privately owned and operated company that was incorporated in early 2003. Founders, and brothers, Manuel and Javier Oblitas began the company as a partnership in 1998 and grew to the existing 18 man/woman team through hard work and continually staying abreast of new technologies and design ideas. We are currently certified through the South Central Texas Regional Certification Agency (SCTRCA) as a Minority Business Enterprise (MBE) as well as a Small Business Enterprise (SBE). We are a small company with big ideas and we are constantly and consistenly growing. 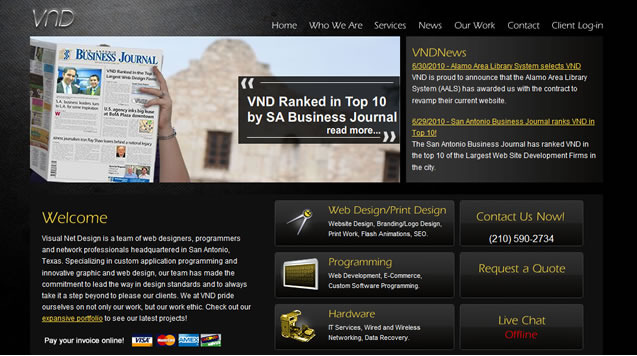 As published in the San Antonio Business Journal, VND has ranked in the top 10 for Largest Web Design Firms in San Antonio for the past 4 consecutive years. Follow us on Twitter of become a fan on Facebook! Visual Net Design is a team of web designers, programmers and network professionals headquartered in San Antonio, Texas. Specializing in custom application programming and innovative graphic and web design, our team has made the commitment to lead the way in design standards and to always take it a step beyond to please our clients. We at VND pride ourselves on not only our work, but our work ethic. Check out our expansive portfolio to see our latest projects!